Do you offer a lot of different products? Various product families or ranges? Or do you even offer services to complement certain items? The PARX Product Picker would make the way you draw up quotations and/or enter orders a great deal easier. The products can be filtered in several stages and the appropriate services can be suggested to go along with them. The PARX Product Picker is one of our standard products and can be implemented into an existing instance with minimal effort in a short time. The PARX Product Picker makes it possible to add products to an opportunity more efficiently. The items can be filtered at multiple stages. 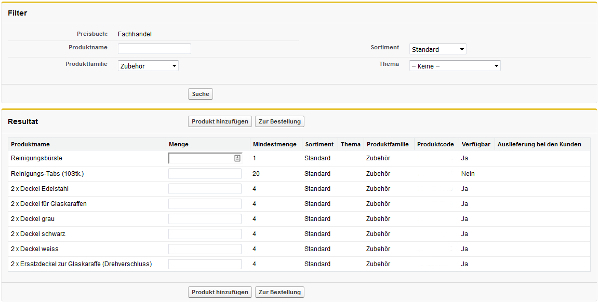 We save the selection criteria (product family, range, promotion, etc.) specifically for your product range. The criteria corresponding to the item are presented clearly with details such as quantity in a box, EAN code, product code, etc. A further function is a display of the items ordered most frequently by the customer. The quantity ordered most recently and the order date can be viewed. If you offer services that complement the item (service contracts, support, installation, etc. ), these are displayed immediately as the relevant items are selected and are therefore not overlooked when the order is recorded. The PARX Product Picker makes it possible, for example, for sales reps to select items quickly while they are with the customer and to send off the order. The PARX Product Picker also makes it possible for you to choose multi-stage selection of items and to compile them into a quotation. The price lists for the specific customer group are saved or the price is calculated using the corresponding logic, including any discounts. As a result, your sales team can draw up customised quotations efficiently, directly from Salesforce and with no media discontinuities. The PARX Product Picker is one of our standard products and can be installed in its basic version into an existing instance of Salesforce quickly and with little effort. Get in touch and we will make your process for entering orders or drawing up quotations more efficient. Your sales team will love you! The field sales staff of Rapelli visit their customers armed with an iPad. The tablet provides a product catalogue with customised, up-to-date prices, information about forthcoming offers, product illustrations and ingredients. They can enter orders directly on the iPad using the order wizard. Sunstar is controlling its internal data management for sales and for visit planning, documentation and evaluation by the field sales team using Salesforce and SAP. By integrating SAP, a general harmonisation and increase in the productivity of IT processes has been achieved. Aduno is planning to draw up and process its contracts entirely electronically and thus to replace paper contracts. Thanks to the customised application from PARX, which is based on the Salesforce Platform, field sales staff can now set up contracts directly while they are with the customer.